If you have been tuning into our TV program you will see I am doing a series called The Real Deal. I am challenging believers to be ‘real Christians for a real world’. In our culture being a Closet Christian (one nobody knows about) is profoundly easy. We mostly act like, talk like, and look like everyone else around us. That is not entirely bad… unless they have no idea that we are believers. If they can’t tell, and at best just see us as really nice people (or worse yet as nasty people), then we are not being real christians for a real world. We have a message that our world desperately needs. When we live like closet Christians we deny our neighbour a chance to hear the great truth that set us free and can do the same for them. At least Homer Simpson knows why Ned Flanders is the nicest guy in Springfield. Ned’s a committed if not sometimes awkward follower of Jesus. 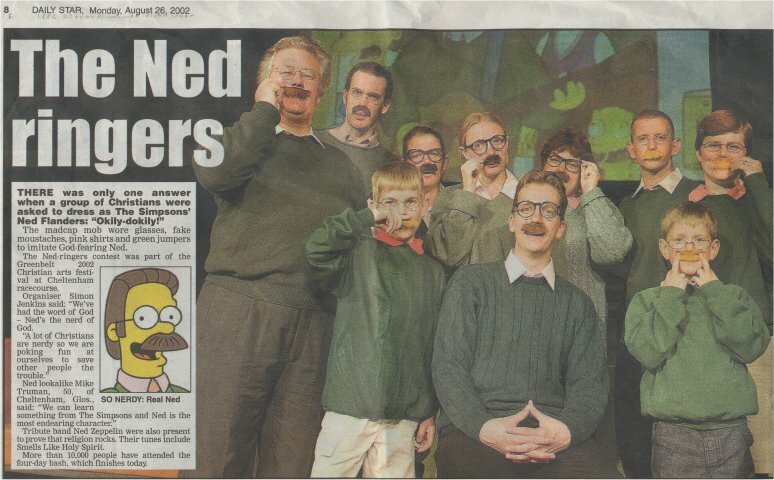 The Ned ringers contest was part of the Greenbelt 2002 Christian arts festival at Cheltenham racecourse. I like to ask my congregation this question: If you were arrested for being a Christian would they have enough evidence to convict you? Being a Christian in many other parts of the world means taking your life in your hands every day. Muslims that convert to Christianity are often disowned by their friends and families. Sometimes they are threatened or even murdered for it. Don’t think for a minute that that is something that only happens on rare occurrences – there are more people martyred for their faith today than any time in 2000 years of Christianity. Those who decide to follow Christ in those places make a decision that their faith is more important than life itself. Here’s an observation to think about; The homosexuals have come out of the closet… and the Christians have gone in. Oh sure, they threw a few stones at each other as they switched locations but even that conflict has pretty much blown over. My point has really nothing to do with the battle for gay rights and everything to do with the fact that you often can barely recognize believers in our culture. The night that Jesus was betrayed Peter boasted that he would never forsake his Lord. Jesus told Peter he would deny Him three times before the rooster crowed twice. The next morning Peter was confronted by a mere servant girl and yet denied Jesus three times. What happened next is the most important part of the story and yet most people miss it. When the rooster crowed twice, Peter remembered what Jesus said and wept bitterly. This was a defining moment for Peter. He was overcome by his own shame and disappointment. Though nothing more is said about it in the narrative, it is clear that Peter made a decision that morning that he was coming out of the closet and would never go back in again. It was Peter who on the day of Pentecost stood out in the street and told a skeptical crowd of thousands that they needed to repent and be converted that their sins could be blotted out by the blood of Jesus. Peter lived the rest of his life as a radical follower of Jesus. 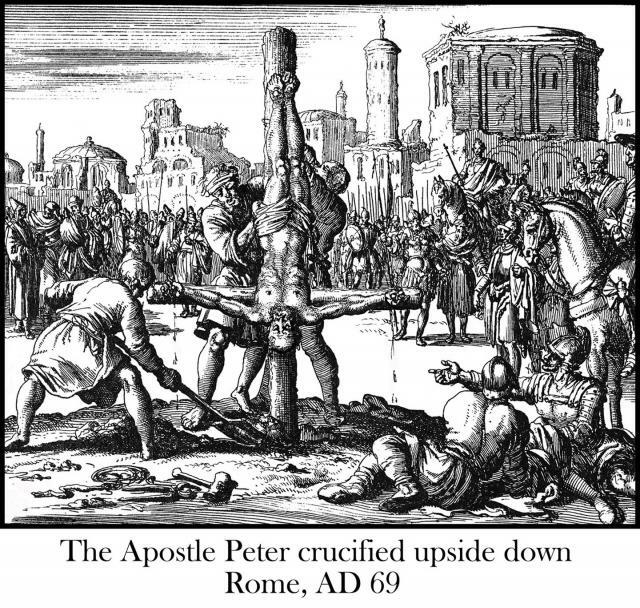 History tells us that when he was sentenced to be crucified himself by the Romans, he insisted in being crucified upside down as he was not worthy of the same death as his Lord. No, our world doesn’t need more church goers that are in the bar Saturday night and in the pew Sunday morning (unless they were there inviting people to church the next day). We need more real Christians for a real world. People that are not ashamed of the fact that Jesus has done an incredible work in their lives. Around the world Christians face the raising of weapons at the name of Jesus. 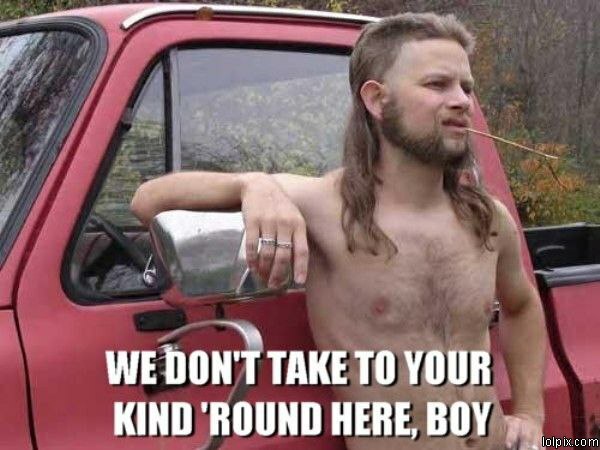 Here, because we have freedom of religion, the worst response we get is someone raising an eyebrow at us. Why we have such trouble living our faith out loud is a bit of a mystery. Maybe we all need a disappointing rooster crowing experience to get us out of the closet. What do you think?